Poway cosmetic dentist Dr. Joe N.T. Nguyen can make your dental crown in one visit. The decayed portion of tooth is cleaned out and the remaining tooth structure is reshaped to allow the crown to fit over. Using Cerec technology we are able to make the crown in office in one visit. Crowns can last many years and will function just like your original tooth. The edge of the crown will usually end at the gumline. The natural tooth structure is present there and can get decay if not properly cleaned and maintained. Great oral hygiene involving brushing and flossing can help the crown last a long time. Great fitting crowns without multiple visits to the dentist. 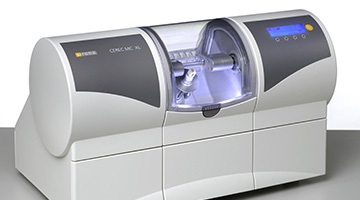 Cerec dentistry in Poway can make your dental visits easier and more comfortable. 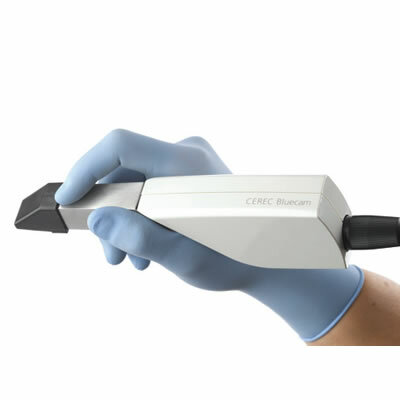 Using a special 3D camera, digital images are taken of the tooth. 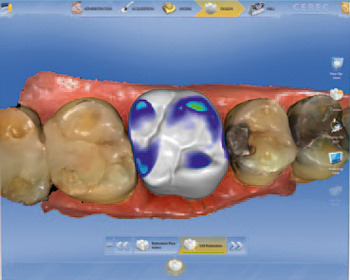 The images then can make a computerized 3 dimensional model of your teeth. 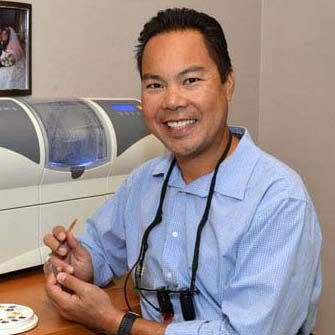 On the computer, Dr. Nguyen will design your personalized dental crown to make sure it looks natural and fits your bite. When the proposed design meets all your goals then our ceramic milling machine will mill out the crown out of a durable ceramic block. Sometimes additional personalization is needed to match the individual characteristics of your teeth. Porcelain glazes and subtle tints are painted onto the dental crown to match your teeth. The crown is placed into a porcelain furnace to cure the ceramic to its final hardness and fuse the glaze. ‘‘I love the fact that he can do crowns in one visit and Esther and her team are so sharp and on top of things.